The USL (2nd league) club Tampa Bay Rowdies proposed expanding their stadium in a bid to join MLS as a future expansion side no. 25-28 (first two clubs will join in 2020). 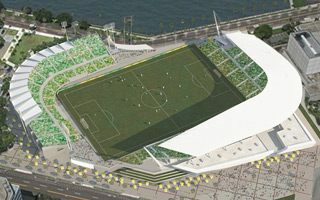 Instead of the current capacity of 7,500, Al Lang Stadium in Staint Petersburg should reach 18,000, as required by the league authorities. It may also become the most bizarre stadium in terms of seating layout. That’s the outcome of its unique history and location. It was built as a baseball stadium, thus the old north stand around north-eastern corner and room for expansion primarily on the opposite end. It’s also equipped with a field lying just 30 meters away from Tampa Bay waters, leaving no free space in the east. New double-tiered stands would be located along the west and south sides of the field. Their architecture is to be inspired by local maritime traditions, specifically sailboats. You’ll notice the masts, sails and hull. This design by Populous and Icon Venue Group will offer majority of the fans a fantastic view of Tampa Bay. Worth an expected $80 million, the project will be financed privately and not exceed current spatial constraints of the site. However, due to its location and public ownership, a referendum is needed for it to go forward. Rowdies’ proposal was already discussed by the city council and referendum might come in May.